Eurotech Racing’s season hit a high at Thruxton with a career best finish in the Dunlop MSA British Touring Car Championship for one of its trio of drivers and a trophy-winning debut for its young rookie. Heading towards Oulton Park, their 2016 campaign is showing promise. The Brands Hatch season opener back at the start of April yielded early encouragement for the Staffordshire outfit with its pair of new-build Honda Civic Type R’s. Having made the switch from the Honda Civic to the Type-R over winter, both Jeff Smith and Martin Depper were able to reap the rewards of an off-season’s hard labour. The former qualified 13th and the latter 16th. Smith would go on to notch a trio of points-scoring finishes, including two top tens with a best coming in race three at the Kent circuit, gradually working through the rounds to the crescendo of a creditable seventh placed finish. Depper was unable to follow through on the pace shown in qualifying but he more than rectified that disappointment at Donington Park. In Leicestershire, at Donington Park, both were able to fulfil the car’s inherent capabilities. Smith again planted the Honda into a strong position on the grid, one better than at Brands – 12th this time. While Depper couldn’t match his team-mate in qualifying, his pace was much stronger come rounds six, seven and eight come Sunday with a best of 11th – good solid points – easily besting any of his trio of results from the Brands Hatch weekend. Smith, meanwhile equalled that excellent seventh placed finish from the season opener with another in race one at Donington Park. Both drivers failed to finish a round apiece, but it was an encouraging weekend, nonetheless. 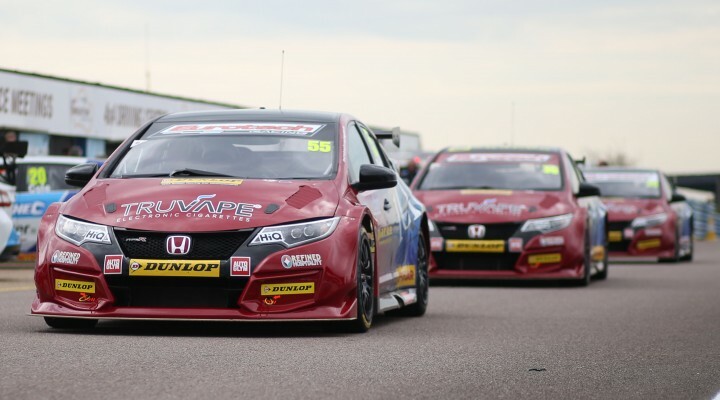 Thruxton provided the highlight of the season so far for both drivers, and the addition of Dan Lloyd in a third Eurotech Racing Honda Civic Type R supplied a further boon. Race one produced what would surely go down as one of the best in Eurotech Racing’s recent history as Depper sealed a career-best finish in what was a frenetic round seven of the BTCC campaign. A multi-car collision on the exit of Club forced the race into an early conclusion and he brought the Honda home fifth, closely following fourth-placed team-mate Smith as both expertly avoided getting caught up in the melee. Additionally, both drivers scored a further points finish each in race three ensuring Eurotech Racing took third spot in the Independent Teams’ standings, just edged out by WIX Racing with Motorbase Performance 25 points clear at the top. The leap to third in the Independents’ coming out of the Thruxton weekend was aided in no small part by Dan Lloyd, the new signing at Eurotech Racing. The Huddersfield racer sealed treble points finishes on his bow, including a best of seventh in race two – taking him to the Jack Sears Trophy for the weekend. Expectations will be high after an impressive start. Oulton Park, for the fourth weekend of the season, is sure to be an event where the squad will look to consolidate and build momentum on what has been a positive opening third of the 2016 campaign. Back in 2013, Jeff Smith looked for all the world like he would tally his first victory in the championship at the Cheshire circuit before a spin at Knickerbrook, gifting the victory to Andrew Jordan. He, and Eurotech Racing, will be hoping for a bit more luck come June 4th/5th. The trio may not be targeting the win as Smith was gunning for back in 2013, but they are sure to be looking for further finishes deep into the points-paying positions to add to their already impressive tally this year.